He and Clegg probably think they're carving up the top jobs in the soon to be established Federal States of Europe. Just as with all the EU motley bunch of peados, liars, cheats and expense fiddlers, they really believe the people are helpless. Just like the poor sods being slaughtered by Mummified Gaddafi. Note the EU wringing of hands and talking shops all trying to gainsay each other. Note, too, this post by GV. Carry on regardless of the corruption, undemocratic governance, failed accounts and flawed, savagely crippling monetary union, killing and starving millions. Lets chat about Libya and ignore the disaster that is Snotty's "woman in muck", Mrs Kellner, aka baroness Ashton of millions of euros a minute fame. That's just her whack, of course. Back to Pseudo. A Foreign "Seketary "as useless as he is at mincing. A job and department already closing down to give way to the superstate that is the EU. A defence of the realm strategy long down the road to extinction. One required to give way to the pan European armed forces.A mixed bag of remote provinces' troops, more than happy to do, as Gaddafi is doing, bomb, strafe and murder anyone getting in the way. Then we have the ECHR, supposedly independent of the EU. Another fabrication and smoke screen. Our Pseudo's joyous acceptance of everything being subsumed, is identical to his predecessors since poofter Heath and his lies. With the possible exception of Maggie they all chase their greater power and place in history. None of these pea brains aware of the political tsunami they are bequeathing future generations. What a huge disappointment Cameron has been and is proving to be. As much a Federalist deluded pillock as Bliar or Snotty. Hateful and treasonous power crazed idiots with not one honest bone in their body. 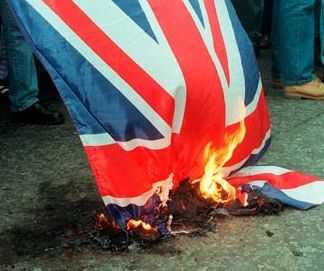 Come on, UK, wake the f**k up! O/T - If you look at your GFC Followers avatars, you will see a black one with with a large, white "X" - hover your mouse over it and it will come up as "Gay Tube". These are the UAF twats who hacked Harbinger's blog and they were showing up at my place, too - in fact they are showing up on every blog that Harbers followed before his blog was compromised. You should go into the Blogger Dashboard, mate, and click where it shows the number of your followers - that will open a new window where you can block those Lefty, gay-boy bastards! Once you block them, Harbinger's avatar will reappear and you can also block that if you want to be more certain they are not spying on you from that hacked blog! Thanks for the link, OR - the eu structure won't go away without a good kicking. Spidey - watch out for seanallensmum too - invited me to be a 'friend'! Scum. Thanks, GV, also avoid seanallensdad or anything else with "seanallen" in it. Another recent one called "Hitler's Cadaver", also subscribed to my YT channel and sent friend requests. They are constantly trying to infiltrate by using new channel names. All these cunts should be hanged. Spidey, GV advice heeded, many thanks.